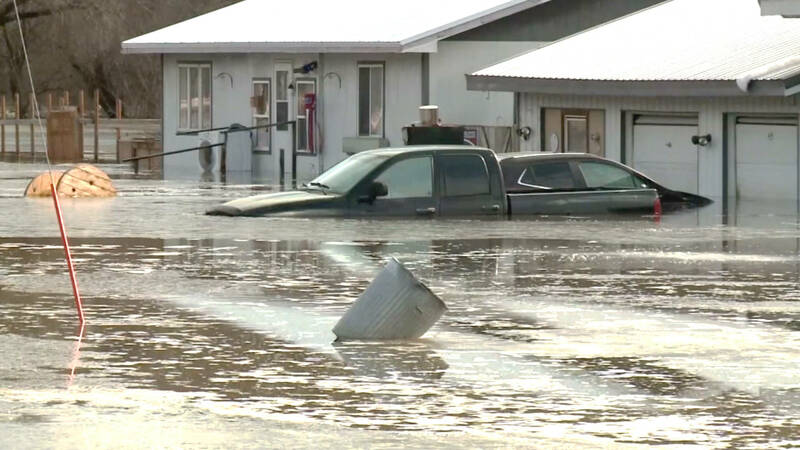 Flooding has inundated the Lakota Pine Ridge Indian Reservation in South Dakota, leading to a serious crisis for its Native American population—and a slow government response that, critics say, exposes the racial imbalance in American disaster relief. "This is a state of emergency right now," said Pine Ridge resident Henry Red Cloud. Rapidly melting snow from a recent blizzard is soaking the reservation and already damaged water lines, cutting the community off from safe drinking water. Roads are mostly impassable mud pits. After seeing how Puerto Rico was treated post-Hurricane Maria, nobody should have expected Pine Ridge to be treated any better. Separate and unequal, that’s life in the US. Mother nature can be a real motha_ _ _ _ _ _. Even upgraded infrastructure spending would not have helped this time. Rain storms across the north dropped 3-6 inches of rain which melted the existing 3-6 inches of snow. 6-12 inches of flood waters in a 12 hour period. Floods in spring are normal, but this sucker must have been a 100 year spring melt. Interesting. Had no idea how much rain actually came down. One report I read was from a professional of some kind stating that this is the worst in his 73 years. It’s a little different than a heavy spring rain storm that would cause some flooding. in Patches of snow in spots that would normally take the standing water, were not able to so the water rose around it. A 2X6 standing on edge along side of my garage floated into the yard next door. The water has never gotten that high in the 40 years I’ve been here. The only worse place to live in the Americas than Pine Ridge is Haiti. It has been that way for decades. Reservations are nothing more than open air prisons for those families that survived being slaughtered. I have no answers. Only tears. And that aquifer is being drained by industrial agriculture. Its not a matter of what america will eat but rather how america could best manage its resources instead of letting greedy capitalist activities exhaust the resources. Hi Mossonarock, well that’s right too. I was just worried about the immediate loss of water! What would we use to grow everything that’s been so polluted and made into GMO food! It would be like the Donner Party stuck with no way to go and nothing to eat! One thing that totally unregulated freemarket does not ever do is self-regulate its use of resources. That’s why it just exhausts resources as it tries to get as much to market as fast as it can to make as much money as quickly as possible. There’s no care for the future. That’s why I am in favor of gov’t management of resources.